Welcome to another JAX Starz Blog Hop! This month we decided to use our new 2015-17 In Colors! I wasn't too sure about the new In Colors until I had them in front of me to play with... they are fantastic! In order my favorites are Tip Top Taupe, Cucumber Crush, Watermelon Wonder, Delightful Dijon, and Mint Macaron. "Stamping Off". 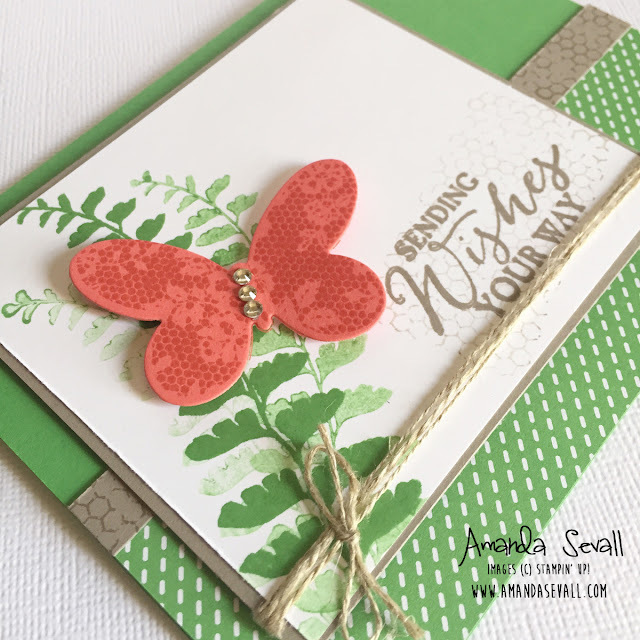 On this particular card, I used a technique referred to as "stamping off" to stamp the leaves behind the butterfly. To "stamp off" you ink your stamp once, then stamp with it multiple times. The result is that the color fades a little bit each time after the initial stamped image as the ink leaves the stamp! Matting. I often mat the different layers of my cards to give them a little definition. 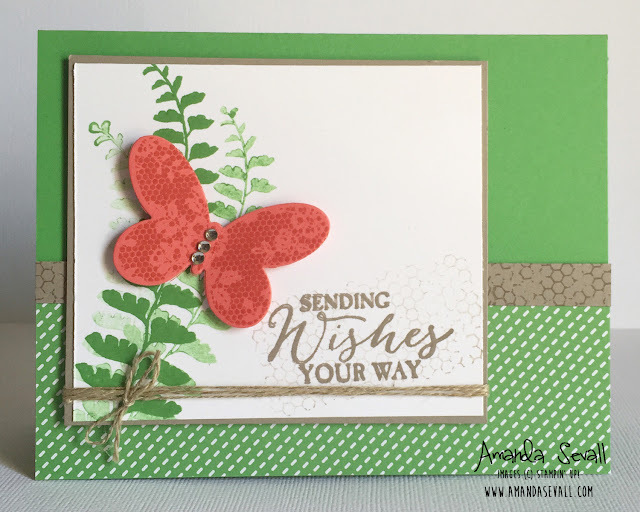 One here I used Tip Top Taupe behind my Whisper White cardstock with the stamped leaves. It sets it off just a little bit and gives it definition. I typically cut my cardstock mats 1/16" or 1/8" larger than the cardstock I am trying to mat. A Little Bling... Goes a long way! It's fun to add a few pieces here and there to add something extra to your card. Don't be afraid to add a few embellishments to your cardd to make it sparkle. Alright, that's all I have today's hop..... the next stop is Amy Unick on this month's Jax Starz Blog Hop! Thanks for visiting and I'll see you next time! I love all this cucumber crush Amanda! Great card! Beautiful! Those colors together totally remind me of watermelon. Beautiful card!!! Love the butterflies with the new in-colors!